Join them for a screening of the film, Code Girl. 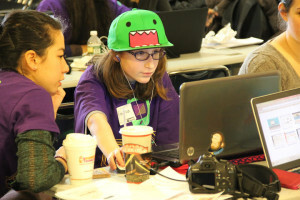 CodeGirl is a documentary that follows teams of high school-aged girls from around the globe as they compete in the annual Technovation Challenge. The girls have three months to develop an app that attempts to solve a problem in their local community. They size up their competition, interact with teachers and local mentors, learn to code, and pitch their ideas. Regional winners travel to California to compete at World Pitch Night in June of 2015. The winning team takes home $10K in funding and support to complete and release the app. Watch the official trailer here (https://youtu.be/cRb5iel-3Ck). Note: this is not a SPS or Garfield HS event and you need to talk to your parents/guardians before registering or attending. Snacks and drink will be provided. Women@Google & Amazon’s Women in Engineering look forward to seeing you! NOTE: Two Dates, Two Different Locations!! REGISTER NOW, SPACE IS LIMITED! Wednesday November 4th at Google’s Kirkland offices, 5:30 – 8:30pm. Movie will start at 6:00. RSVP HERE & Please bring a signed copy of the media release form (PDF linked here) to the event. Register HERE (http://www.eventbrite.com/e/codegirl-screening-at-amazon-tickets-19362154726) Students must be accompanied by an adult with valid Government ID proof. REGISTER NOW, SPACE IS LIMITED!!! * Note: this is not a SPS or Garfield HS event and you need to talk to your parents/guardians before registering or attending.